A rarely available well presented detached family home in this quiet close, built by Crest in 1989 and situated in the heart of Keymer. The property has a good size driveway at the front with parking for at least two cars and double garage. An open covered porch leads to the front door giving access to the spacious tiled hallway which has doors to all the reception rooms, understairs cupboard and cloakroom/WC. The study is at the front of the property looking out to the driveway. The sitting room has a window to the front, feature art deco style gas fireplace with slate hearth and wood surround, double doors open to the dining room which also has a door to the kitchen and sliding double doors to the conservatory. The generous all year-round conservatory has a fitted radiator, tiled floor and double doors to the garden. The spacious kitchen/breakfast room is fitted with a range of white wall and base units with contrasting black worksurfaces, vinyl flooring, electric oven, microwave, 4-ring Ceran hob, Franke stainless steel sink unit, space for a dishwasher, fan heater at ground level and a door to the utility room. The utility room is also fitted with white units, sink, space for washing machine, drier and fridge/freezer, wall mounted Worcester gas boiler and door to the covered side patio area and personal door to the garage. Stairs rise to the first floor where there are four double bedrooms and the family shower room. On the landing is the airing cupboard and hatch to the loose boarded loft space. The master suite at the front of the property has a dressing area with two sets of built in mirrored wardrobes, an en-suite bathroom consisting of a shower bath with Aqualisa shower over, white suite and contrasting tiled floor. 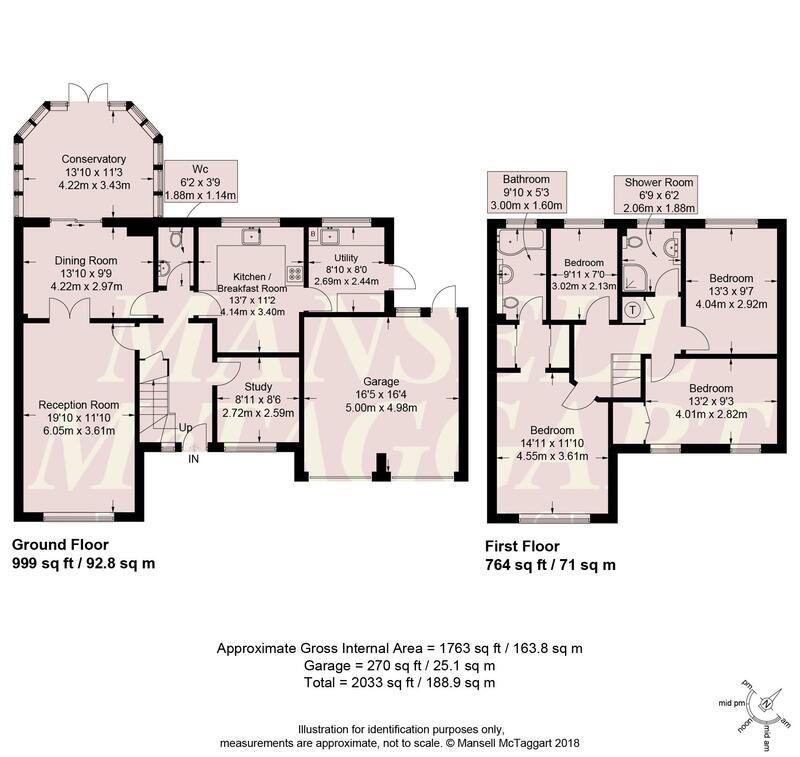 There are three further double bedrooms one of which has built in wardrobe cupboards and another a large cupboard over the stairwell. Outside, the front of the property has an area of lawn with shrubs and trees, the driveway with space for at least two cars leads to the double garage and path to the porch area for the front door. The attractive mature rear garden is 50’ X 60’ mainly faces west, is laid to lawn with an abundance of shrubs, beds and trees (TPO on the Oak), two large areas of patio, an arbour, a summerhouse with power and light, a side potting shed attached to the house also with power and light, covered area (with power sockets) leading to the rear personal door of the garage and side gate to the front. The double garage (in the past been used as a workshop) has power and light and is accessed by two up and over doors. Other benefits include gas central heating and refitted double glazing throughout. A rarely available four bedroom family home within easy reach of all amenities OFFERED FOR SALE WITH VACANT POSSESSION AND NO ONWARD CHAIN. From our office in the centre of Hassocks head East on the Keymer Road, The Minells can be found on the right hand side. A well presented lovely family home in a secluded position. No onward chain. NOTE: There is an annual charge of £100.00 for the upkeep of the private road.